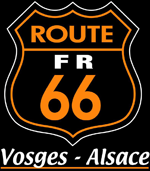 We, Mark and Ietske de Vries, have a hotel on the border of the Alsace and the Vosges since April 1998. Why does a Dutch family move to the Alsace? In the Netherlands we owned a cheese and wine shop, but after seven years, we decided, we would like a new challenge. We read a small advertisement in a Dutch newspaper about this hotel. We made an appointment with the Belgian owner, and one week later, we bought the place. Within two months, we sold our house and our shop, and moved to France with our daughters Inge and Emma who were 1½ and 5½ years old. They already live on their own and work in Germany and Luxemburg. As for us.... Well, we still love to work and live here and enjoy our guests and the nature that surrounds us.